At PrimeHome our objective is to make products that make your life better. We guarantee this charging station will make your life more convenient, efficient, and overall enjoyable! Also, the high quality materials guarantee charging safety and security. 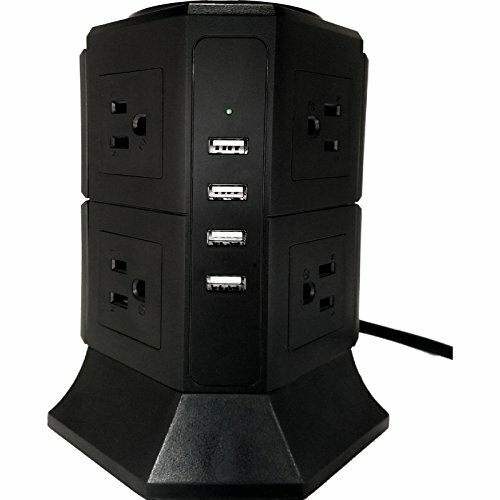 Our unique tower design provides 8 outlets and 4 USB ports, with plenty of room and power to quickly charge multiple devises at once. We all hate bending down and trying to find an outlet...The six foot cord provides enough length to position the charging tower on your desk and pug into an outlet, Eliminating The Back Ache! We designed our charging tower to handle your smart phone, laptops, tablets, cameras and many more office and/or home devises. The double pole switch can cut off live and neutral lines at the same time, providing overload protection. The shell of the tower is made of fire retardant material, offering additional protection. While convenience is something we strive for, safety is something we demand. The Smart Charging Design Automatically Delivers The Optimal Charge For Multiple Devises! The USB LED Indicator Light Tells You When Power Is Going To The USB Ports And Ensures You When Power Has Been Disconnected! Designed To Be Appealing In The Office Or At Home! With 8 Outlets and 4 USB Charging Ports, This Will Handle All Of Your Charging Needs! Well Equip For Smart Phones, Laptops, Tablets, Cameras, Printers, Speaker, Modems, And Many Other Devises You Use At Home Or In The Office! At Only 6.5 Inches Tall And 5.5 Inches Wide, Fits Perfectly In Any Space! No More Plug In Yoga, Trying To Get To An Outlet... With This Product Power Will Be At Your Finger Tips! While We Strive To Make Your Life More Convent and Efficient, We Also Focus On Safety. With A Built In Surge Protector, You Will Work Assured Knowing All Of Your Devises Are Protected! If you have any questions about this product by Prime Home, contact us by completing and submitting the form below. If you are looking for a specif part number, please include it with your message.